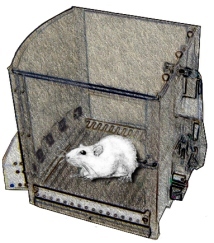 This test was developed as a rodent analog of the continuous performance task (CPT) of sustained attention in humans. The task is conducted in an operant chamber without levers. Instead of levers there are 5 apertures which can be briefly illuminated via light-emitting diodes located at the rear of each aperture. A rat is rewarded with a food pellet if it places its nose in the correct aperture (target nose poke) within 5 seconds of a light stimulus (duration is usually 0.5 sec). The visual target is presented randomly in one of the 5 holes and a large number of trials (usually around 100) are presented in a session. Several aspects of the animals performance are assessed (accuracy = % correct), anticipatory responses (premature nose pokes which are thought to be analogous to impulsivity in humans) and perseverative responses (additional nose pokes following a correct response before a new trial is initiated, which are thought to be analogous to compulsive behaviors in humans). This test is useful for studying the effects of drugs, aging, and other factors on sustained attention.